A staple impaled my finger. Blood dripped on the little reading pamphlets I was collating and stapling together. This was my first time volunteering at my son’s kindergarten class four years ago and within minutes of arriving I was ready to skulk off and cry. I opted for the latter, grabbed some tissues to dab away the blood. I needed a distraction and craned my neck to see what my son was doing in class. “Look mama, I’m reading,” Shawn exclaimed, his pointer finger sweeping over the words too fast to actually be reading. Despite my clumsy start as a parent volunteer, I was compelled to be there for my son and participate in his activities because that’s what good parents do. Right? When my son was in first grade, I baked cookies for the Mother’s Day end-of-year celebration. All the parents sat in tiny school chairs and we smiled as our children posed for a class photo. A fart was heard from the smiling children and my son shot his hand up and proudly announced, “That was me,” and laughed. As we bolted out of the school, I squeezed my son’s hand and through clenched teeth threatened to never return for any more school activities again. 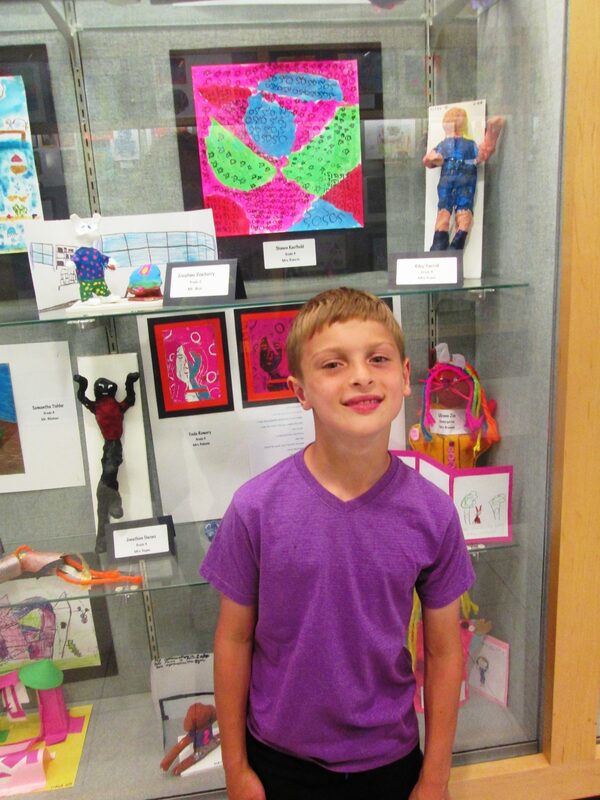 Two years later, with memories of first grade fully repressed, I decided to volunteer at the Art Show. The Art Show is one of my favorite school events of the year. The hallways are curated with student art and I always marveled over the hours it must have taken to display everything. I showed up after school and was paired with another mom to work on a hallway. I tried being friendly and chatted the woman up, reminded her we had met before. She just gave me a mannequin smile and got to work stapling. I was a little nervous wielding a stapler again. Carefully, I approached an empty glass display with my cart of assorted 5th grade papier-mâché sculptures, third grade self-portraits, 4th grade dream home designs and kindergarten stenciling. I was just about to place a glazed mask on the top shelf when the other volunteer shoved me off my step stool, forcing me to land on my feet like a cat. The aggressive mom placed a porcelain Chinese dragon right where I planned to position my mask. No apology, no “oops,” the woman returned to her glass case as if nothing happened. I looked up and down the hallway to see if anyone saw the assault, but the school was quiet. Why did I continue to torture myself volunteering? In my mind it was to show my son that I cared and took an interest in his school. I was creating memories of good parenting. But I would leave these events and activities irked, maimed or emotionally traumatized. Nonetheless, I found myself back at the school just a few days ago volunteering to help with the backstage logistics for a play my son was in. I was a little late arriving to the dress rehearsal due to work obligations. The teacher, harried and perturbed over my tardiness told me to help the students know when to go on stage. The problem was, I didn’t know which students were playing what characters. “That works too,” I yelled to the fifth grader’s back. I then saw Jeff*, a member of the play’s ensemble wandering around behind the curtain. I studied the boy’s face and realized that Jeff wore glasses. This look-alike didn’t have glasses, “Oh, there are two of you! ?” this was Jeff’s twin brother James*. I decided that interacting with the kids might not be a good fit for me. Instead, I drew a makeshift magic marker poster to promote the play’s ticket sales and stood at the entrance of the school to sell tickets, ignoring the turned up noses and curled lips of parents who refused to buy a $7 ticket to the performance. After my failed attempt at ticket sales, I returned to interact with the students. I painted bright pink lipstick on pouty lips, carefully penciled eyeliner on doe eyes and hung up costumes when the actors ran home for a late dinner or Little League practice. The next day, when I watched my son and all his peers sing, dance, act, hit their cues, I was moved to tears. As a volunteer, I saw first-hand children’s hard work and the anticipation of their acting debut. I understood the logistics each child and teacher went through to present a stunning, nearly flawless performance. Maybe I am the worst volunteer that ever lived, but it was fun to have an inside glimpse into my son’s world. The faux pas, stabbed fingers and utter humiliation is worth having a front row seat to the precious moments in my son’s childhood. I love this, Brenda. I am willing to bet pretty much every helpful Mom has been in your shoes at some time in their child’s school career. Nice writing.